The Pacific Rim Review of Books, Issue 23, Volume 12, No. 1, by Linda Rogers. Extensive and really quite amazing. Not available online yet. Here’s the page for Courtepointe, the French translation of Patrin, just released by Marchand de Feuilles in Montreal. It’s a lovely size and an elegant addition to the shelves that hold my books. Euclid’s Orchard is available for pre-order on the Mother Tongue Publishing website! The cover is so beautiful and the page design is elegant and clear. I can hardly wait to hold a copy in my own two hands. There’s a lovely review of Euclid’s Orchard at https://www.goodreads.com/book/show/35564139-euclid-s-orchard-and-other-essays?from_search=true —just scroll past the negative review and read the nice one! As the year falls towards autumn, I’m eager to return to work on my novella-in-progress. I can smell the Thompson River in my dreams and the main character of The Marriage of Rivers smells it too. In the meantime, how nice to read this generous commentary on Winter Wren. After my event at the Sunshine Coast Festival of the Written Arts two weeks ago, people came up afterwards — and for the rest of the weekend, as well as via email! — to ask about other novellas. It seems that readers have no problem with their length. No problem with the price. (Winter Wren is $18, about what a poetry book would cost, and for those who love poetry and/or novellas– for us, in this very household, both! — it’s pretty reasonable.) People wondered why there was reluctance on the part of the bigger publishers to simply make all forms available. The economics of Winter Wren — not onerous. The difficulty is actually getting it into the hands of readers. Lots of copies were sold at the Festival two weeks ago. But bookstores seem reluctant to order (though they will get the usual bookstore discount, as will libraries and institutions). For bookstores in and around Victoria, B.C., I have a willing accomplice who will hand-deliver copies. So if it’s mailing charges or fear, rest easy! Order a few. Read it and pass it along. No one has said anything disappointing yet! People continue to send wonderful messages about Winter Wren and I’m relieved that the print run is quickly selling. (I had visions of boxes of books stacked up in every corner of the house and am glad to report that we are down to one remaining carton.) Thank you to everyone who has shown such faith and generosity to an unlikely venture in the 21st century. A press devoted to the literary novella! There’s a review of Winter Wren in Geist 101, on the newsstands now. I like the reviewer Michael Hayward’s comment that “The beauty of the novella format is what might be called its ‘ample brevity’ : long enough to develop characters, to establish a mood and flesh out a specific setting; brief enough to read through in a day or two.” Hear, hear. Best part? Oh, maybe this paragraph! Kishkan’s new novella, Winter Wren, is a phenomenal read, and the latest evidence that there’s no accounting for which artists are the ones who get famous. Kishkan has a wonderful touch with small moments, and indeed this novella is largely constructed of small moments surrounding some vastly larger moments, laconically told. May, 2016. Fish Gotta Swim Editions is a new imprint created by Anik See and me to showcase the literary novella and other innovative prose forms. Our first title is my Winter Wren, released this month and available for purchase in selected book stores or from me (for North, Central, and South American orders) at theresakishkan at gmail.com. Readers in Europe, the UK, and elsewhere can order from aniksee at kpnlplanet.nl We have a limited number of letterpress keepsakes to include with orders. Patrin is the old word for the clues Roma people left for their travelling fellows – a handful of leaves or twigs tied to a tree. Patrin Szkandery, a young woman living in Victoria BC in the 1970s, restores an ancient quilt and travels to Czechoslovakia to trace her Roma history over the unsettling terrain of central Europe in the years of the Austro-Hungarian Empire. The pieced cloth proves to be both coded map and palimpsest (patrin) of her extended family’s nomadic wandering through Moravia in the first decade of the 20th century. The elegant and beautifully attentive lyric prose of Kishkan’s earlier work in fiction and memoir is augmented here with masterful pace and plotting. Patrin is a little jewel of a novella, an exquisitely nuanced and moving glimpse into the grand themes of exile and homecoming across continents. Stitched seamlessly it is a suspenseful and historic tale. 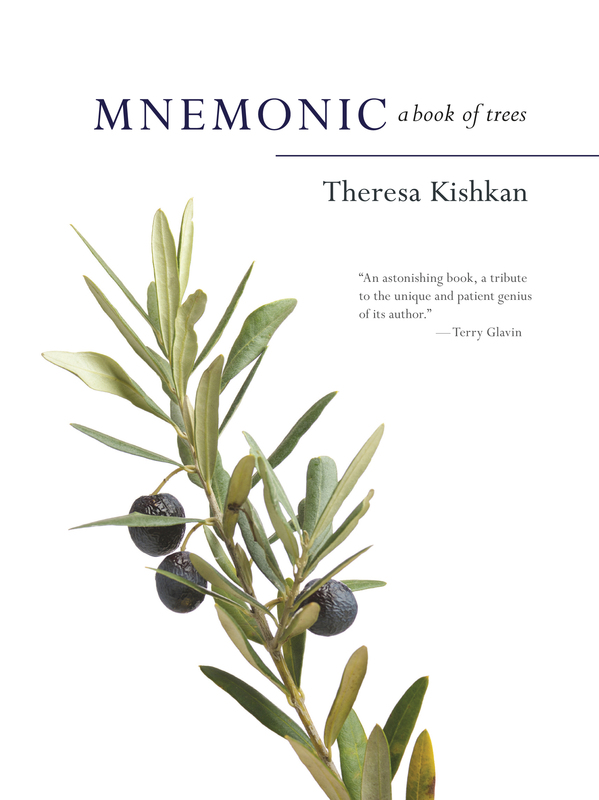 Warm, imaginative, and thoroughly original, this memoir intertwines the mysteries of trees with the defining moments in the life of novelist and essayist Theresa Kishkan. For Kishkan, trees are memory markers of life, and in this book she explores the presence of trees in nature, in culture, and in her personal history. Naming each chapter for a particular tree — the Garry oak, the Ponderosa pine, the silver olive, the Plane tree, the Arbutus, and others — she draws on Pliny the Elder’s Natural History, John Evelyn’s Sylva, and strands of mythology from other classical and contemporary sources to blend scientific fact with natural history and the artifacts of human culture. Nominated for the Hubert Evans Award, B.C. Book Prizes 2012. Individual chapters nominated for the Pushcart Prize, National Magazine Award, and “Olea europaea: Young Woman With Eros On Her Shoulder” named by Contrary as one of its top ten commentary pieces over the past ten years. The Age of Water Lilies, Brindle and Glass, 2009. With The Age of Water Lilies, Theresa Kishkan has written a beautiful novel that travels from the time of colonial wars to the pacifist movement to 1960s Victoria, and shares a unique and delightful relationship between 70-year-old Flora and 7-year-old Tessa. When Flora Oakden leaves her English home in 1912 for the fledgling community of Walhachin in British Columbia’s interior, she doesn’t expect to fall in love with the dry sage-scented benchlands above the Thompson River-and with the charismatic labourer who is working in the orchard. When he and all the men of Walhachin return to Europe and the battlefields of France, Flora remains behind, pregnant and unmarried. Shunned by those remaining in the settlement, she travels west to Victoria and meets freethinker Ann Ogilvie, who provides shelter for her in a house overlooking the Ross Bay Cemetery. Fifty years later, among the headstones of Ross Bay, curious young Tessa is mapping her own personal domain when her life becomes interwoven with that of her neighbour, the now-elderly Flora. Out of their friendship, a larger world opens up for these unlikely companions. Theresa has written a sweeping story that transcends time and springs from a passionate exploration of the natural world, its weather, seasons and plants. Phantom Limb, Thistledown Press, 2007. In Phantom Limb, Kishkan invites her readers to explore culture and nature by looking at landscape and place through a series of historical lenses, ranging from natural history to family history to the broader notions of regional and human history. In her popular essay “month of wild berries picking” she reveals the extent to which native stories articulate the complexity and importance of rules that govern relationships between species, a profoundly symbiotic world where one respected not just the territory of another species but its dung, its bones, its very spirit as well. Resonating throughout this collection, especially when describing the natural world or in her travel essays, is a rich lyricism and a distinctive visceral imagery. Kishkan is among those literary naturalists whose words transcend the flora and fauna to engage human relationships, social concerns, historical milieus, and political boundaries. 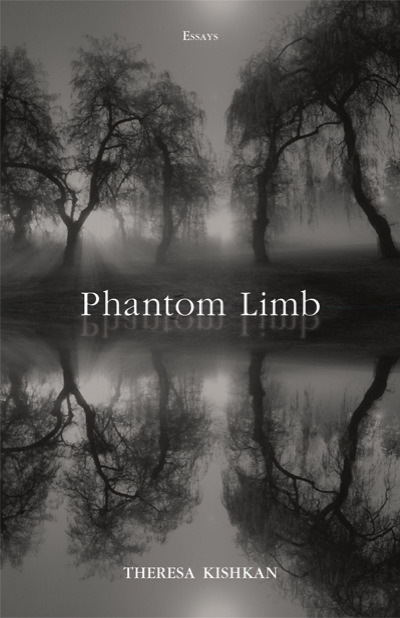 For these reasons Phantom Limb stands elegantly in its own energy and light. A Man In A Distant Field, Dundurn Press, 2004. Declan O’Malley came to the coast of British Columbia because it was as far away from Ireland as he could possibly go. Haunted by memories of his family’s death at the hands of the Black and Tans, Declan is unable to escape his grief. He immerses himself in a new life, seeking to produce a more perfect translation of Homer’s Odyssey while at the same time becoming closer to the family on whose property he is living. But Declan cannot free himself from his past, and when Ireland beckons, he is drawn to his own history and to the opportunity for a happier future. “It’s no accident that the great early 20th-century writers – Ezra Pound, T.S. Eliot, James Joyce – seized on Odysseus as the anti-heroic archetype of man in the modern age. The Trojan War was a kind of cultural civil war with reverberations that ultimately destroyed the world of the victors. Of the survivors, only Odysseus, the failed conscientious objector, offered hope of redemption through faith, endurance and the transformation of the self. With her new novel, A Man in a Distant Field, Sunshine Coast author Theresa Kishkan demonstrates that the story of the archetypal survivor has lost none of its epic emotional power, despite being mocked by a popular reality TV show. Like Odysseus, Declan O’Malley is one of history’s walking wounded. An Irish schoolteacher and the victim of a horrific atrocity inflicted by the Black and Tans, he has fled to the farthest shore of the world, the coast of British Columbia. In 1922, Oyster Bay on the Sechelt Peninsula is still a grey area. The natives’ waning prehistoric culture touches the frayed edge of a colonial pioneer culture stretched to its limits. Here, where even the sea has no memory of Ireland, he becomes a beachcomber and lives the marginal life of a man marooned between worlds. But all we are is the sum of our memories, Declan discovers as he labours with his old Greek primer to make a personal translation of The Odyssey as a way to keep from going barking mad. Inevitably, the correspondences between the sufferings of Odysseus and his own deep loss open possibilities of escape from alienation. His rescue of, and reverence for, an old native burial canoe – a kind of symbol of the doomed ship of Odysseus – invites him to experience the creation of a new canoe with local native fishermen. Through his translation work, Declan rediscovers himself as a teacher. He uses it to teach Rose Neil, his landlord’s bright 12-year-old daughter, to read. Recognizing Rose as the person who has saved him so he can complete his journey, he returns to still-troubled Ireland to confront his ghosts, reclaim his identity and earn the love of a Penelope who mourns her own loss yet keeps faith with the idea of love. Kishkan carries all this off masterfully in a scant 300 pages by combining the crafts of the poet and the screenwriter. There isn’t a moment in this novel when you can’t “see” something intensely, whether it’s the shining black dorsals of a pod of killer whales shadowing a cedar canoe or the wildflowers growing around a secret “Mass stone” where Irish Catholics were driven to take the sacraments in the wilds. The cadences of Irish speech, not only in the dialogue but subtly woven into the narrative, maintain the continuity of Declan O’Malley’s mood, as well as a sense of the period. Kishkan also uses a technique from classical Greek drama. A powerful sense of horrific violence informs the story, but the violent events all occur “offstage,” recounted in dialogue or as memory flashbacks. The only one that forms part of the action is the aftermath of a beating. The novel is constructed like a play in reverse. Instead of creating minimal sets and suggestive backdrops in front of which the dramatic action occurs, Kishkan evokes a backdrop of garishly violent historical events, in front of which small mundane rituals of sanity and redemption are acted out: planting seeds, building shelters, cooking, talking, teaching, dressing the wounds of young idealists, offering hospitality to strangers, learning to love. An emerging poet in the late 1970s and early ’80s, Kishkan married award-winning poet John Pass, built a house on the Sunshine Coast, raised three children with him and was mostly too busy to write. According to her, she discovered she’d “lost her poetic voice” when she began writing seriously again in the early ’90s. 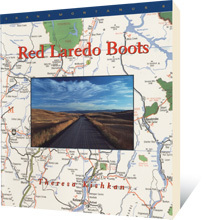 To find a voice, she turned to prose, producing a collection of essays, Red Laredo Boots, in 1996. Then in 1999 she published the exquisitely poetic novella Inishbream. In her first full-length novel, Sisters of Grass (2000), set in the B.C. Interior, she was already experimenting with the tricky virtuoso act of weaving the thread of a lyrically apprehended “ordinary” life into the warp and woof of history and tradition. The result was a hauntingly beautiful, but distinctively regional, novel. In A Man in a Distant Field, she applies the method to a transformative period in modern Western culture. She picks up the classic thread dropped by postmodern Play-Doh writers and weaves it into a tragic tapestry worthy of Penelope herself. ” — John Moore, Vancouver Sun. Sisters of Grass, Goose Lane Editions, 2000. In her vibrant first novel Sisters of Grass, Theresa Kishkan weaves a tapestry of the senses through the touchstones of a young woman’s life. Anna is preparing an exhibit of textiles reflecting life in central British Columbia a century ago. In a forgotten corner of a museum, she discovers a dusty cardboard box containing the century-old personal effects of a Nicola valley woman. Fascinated by the artifacts, she reconstructs the story of their owner, Margaret Stuart. Margaret, the daughter of a Native mother and a Scottish-American father, she tries to fit into both worlds. She’s taught photography by a visiting Columbia University anthropology student that she falls in love with. Inishbream, Goose Lane Editions, 2001. A wanderer arrives by chance on Inishbream, a rocky dot in the sea just off the west coast of Ireland. A lover of boats and a strong worker, she soon marries the young owner of her stone cottage. For a time, she does her woman’s work, fishes with her husband, and walks along the shore, imagining Saint Brendan and the invisible world so real to the islanders. Through the winter, she repays Inishbream storytellers with tales of coastal British Columbia, not so very different, after all, from their own. In the spring, the islanders learn that their isolation will end: the government has promised them modern houses on the mainland. The wanderer cannot wait for the migration; she must leave Inishbream and go home alone. In the islanders’ soft dialect and the wanderer’s own tongue, Inishbream conjures relationships between the newcomer and her husband, between the island people, the sea, and the land, and between the coastal landscapes of reality and imagination. In the uneasy peace of partial acceptance, the foreigner grows, changes, and starts to envision her own place in the world. Inishbream is also available in a hand-printed and hand-bound limited edition from Barbarian Press. That Inishbream was chosen for this exclusive private edition attests to the clarity of Theresa Kishkan’s storytelling and the beauty of her writing. Red Laredo Boots, New Star Books, 1996. As a girl growing up in British Columbia, and now as a mother with a family of her own, Theresa Kishkan has travelled and camped the length and breadth of the province. In these lyrical essays describing her journeys, Kishkan brings to life a landscape impregnated with history and memory, from the Skeena Valley in the north through the dry plateau of the Nicola Valley to Saltspring, Bella Coola, and the west coast of Vancouver Island. Red Laredo Boots is Number 6 in the Transmontanus series of books edited by Terry Glavin.